To foster inclusive community participation by providing an environmentally sound facility for arts, education, recreation, celebration, and locally based human services in order to increase opportunity for personal and collective growth in our community. Human Service ~ To nourish the people of Bolinas by providing food programs, emergency shelter and by promoting a safe and sanitary community environment for all ages and cultures. Cultural Service ~ Promote community enrichment through intercultural events, music, theater, dance, literary, media and visual arts. Partnership ~ Work with local non profits, organizations and schools to provide opportunities for fund raising, community building, community service and education. Foster Community ~ Through hosting holiday meals, town meetings, family gatherings, individual recognition and memorials. Environmental Responsibility ~ Strive to lead by example by implementing programs and practices that reduce, reuse, recycle and renew. Sustainability ~ Use our mission statement and goals to achieve our financial needs and future aims. Provide care, restoration and improvement of the facilities. Support staff development, increase volunteer engagement and energize board participation. 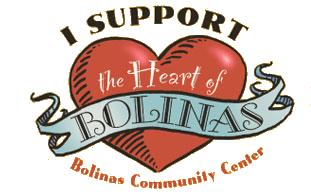 To nourish the people of Bolinas by providing food programs, emergency shelter and by promoting a safe and sanitary community environment for all ages and cultures. We have a partnership with San Francisco and Marin City Food Banks, offering take-home food once a week, Thursdays at noon. This program is well attended with 40–60 people attending each day. The majority are seniors and Latinos. Though the participants voluntarily help with the set-up and clean-up, a small amount of funding would help with janitorial services after this event. Our partnership with There’s No Place Like Home provides a monthly meal and counselling for the homeless and needy. As a shelter site designated by the Disaster Council, we offer temporary shelter should a disaster occur. We would like to expand our preparedness. Oversight of the Bolinas Freebox helps provide clothing and household items for all. Local donations and volunteer help keep this much loved institution running. Providing downtown restrooms open everyday to the public. This is one of the most expensive services provided and is funded (drive for funds spearheaded by the Center) by locals concerned with keeping the downtown sanitary and grants in the past from the county. Village and Beach Cleanup, funded by the community, the BCC, and the County of Marin, and administered by the Center. As part of the cleanup we invited and made space for the Conservation Corps to participate in recycling. Promote community enrichment through intercultural events, music, theater, dance, literary, media and visual arts. The center supports many local events by its low rental fees. Membership dues and grants help off set the real costs for classes and events to happen here. Besides offering a place for local music, theater, dance, literary, media and visual arts it is actively promoting intercultural events like Dia de los Muertes and Posada and inter-generational events like the Art Attack. We are always looking for ways to expand and support this important way of cultivating community. Work with local non profits, organizations and schools to provide opportunities for fund raising, community building, community service and education. Other organizations, non-profits and schools in town rely on our low-cost facilities to raise money for their own causes. We are always working to find ways through grants and other funds to keep rental fees to these organizations low. Through hosting town meetings, family gatherings, holiday meals, recognition of community service and memorials. Bringing individuals together to celebrate or to mourn is the most basic way community happens. We provide seed money and facilities for a Community Thanksgiving and Christmas lunch. At times of great concern we open the Center freely to the Community and help co-ordinate facilitation. Events of recognition of Community leaders are subsidized by the general fund as are memorials for community members. Sponsoring a number of free weekly events; games night for families, movies, and performances. Engaging a larger community by producing a newsletter which includes the Stinson Beach Community Center and reaches every box holder in both Communities. Originally funded by the Bolinas Stinson fund. Strive to lead by example by implementing programs and practices that reduce, reuse, recycle and renew. The Bolinas Freebox has been a 30-year success story in how to reduce, reuse, recycle and renew, supported by Freebox Fashion benefits and a strong history of volunteerism. The Center has always provided washable dinnerware, and now insists renters use environmental non-plastic compostable disposables, available at the center. Free filtered water at all events, no bottled water and conservation when ever possible. Recycling program with the Conservation Corps at the Center and both beach entrances. Educating the public on their part in keeping the beaches clean. Installing solar to provide green energy. A project in process with an ongoing search for funding. Use our mission statement and goals to achieve our financial needs and future aims. Provide care, restoration and improvement of the facilities. Support staff development, increase volunteer engagement and energize board participation.